When my chef tasted this he said, “oh, mmmm, oh-ho-ho, that’s incredible.” Yes, this double-signature dulce de leche apple nut cake is THAT good. Their signature + my signature = signature-signature. Double Signature Dulce de Leche Apple Nut Cake. Last time I was at The Elephant Room, Tony and I were discussing the Mexican influences on his menu and I asked where in Rhode Island I could get Dulce de Leche. He told me about a Mexican Market on the north-ish side of Providence. But I live on the south of Providence, almost 10 miles away from that place. If you know anything about Rhode Islanders, you understand why traveling more than 5 miles for anything is like taking an extended journey. It requires packing snacks and drinks. So I decided to make my own Dulce de Leche. I also decided to take this opportunity to make dulce de leche my way. I prefer it thinner than the traditional version. While messing with food-tradition is a sacrilege to some people, to me, it’s the quickest way to ultimate food-pleasure. So I fooled around with Alton Brown’s recipe and came up with my version. In a 4-quart sauce pan (yes, that large–this stuff foams up!) combine the milk and sugar. Bring to a simmer over medium heat, stirring until the sugar dissolves. Add the baking soda and stir. Reduce heat to low and continue to cook. You can walk away (but set a timer !!! lest you forget to come back and check your concoction to give it a gentle stir every 20-30 minutes). After an hour of cooking, when you’re thinking, “Excuse me, I thought Dulce de Leche was, like, caramel-colored!”, stir in the vanilla (but not vigorously, don’t stir in the foam). No, this little addition will not turn your brew caramel-colored. But just wait; time and reduction-by-heat-evaporation will slowly work some magic. Soon enough you’ll witness an amazing presto-change-o color transformation. After another 1/2 hour (or longer–it depends on how low your heat is and how humid the atmosphere is), when the mixture has reduced by half, pour it through a fine-meshed strainer into a heat-proof bowl. You can store this in the refrigerator in a sealed container (a recycled peanut-butter jar is perfect) for up to a month. Drizzle this over a couple slices of my signature Apple Nut Cake (recipe here). 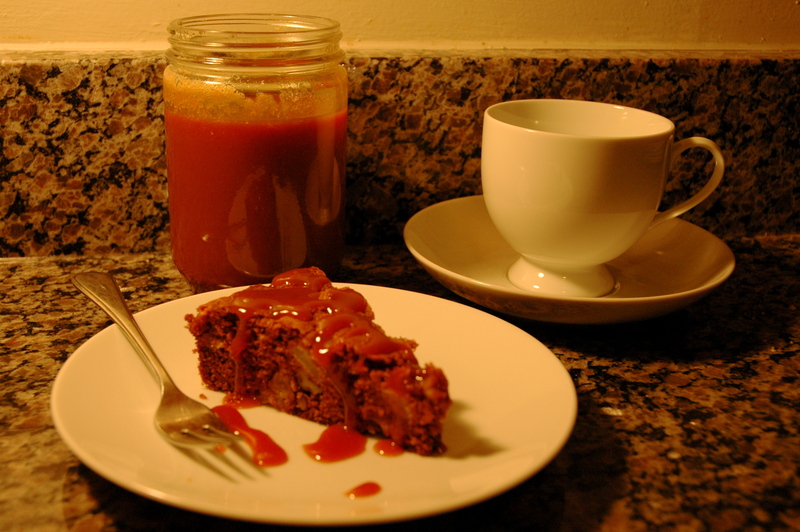 Pour some perfect tea or coffee for a friend and you, and enjoy a Double Signature Dulce de Leche Apple Nut Cake experience courtesy of Tracy Lee Karner and Tony Lopez. On what will you pour or spread your Dulce de Leche? Delicious looking cake! I am so glad that I follow you. Thanks for the recipe. Now that I know who your are, thanks for popping in…. We attended a anniversary dinner several months ago. After a lovely meal, we moved to the patio for coffee and dessert. A crystal platter had a large center pot (a stainless steel fondue-type pot, only smaller and heated with an oil burner). This sat in the center and was possibly similar to your Dulce de Leche (because the hostess made sure everyone could tolerate half and half) but it also contained brandy and a fruit liqueur of some kind. All kinds of fresh fruits were arranged around the bowl: fresh sliced apples, apricots, pears and mangos, and large whole berries. We each had fondue forks, and we dipped the fruit into the wonderful concoction. She said the sauce was also wonderful drizzled over baked fruit. I think you’re on to a wonderful dessert, Tracy. Wow–I never thought of doing it fondue-style. Imagine, cutting up this cake, along with some fresh fruit, and dipping it all into the dulce de leche…. And the sugar pumpkins are in at Dave’s Marketplace. Now you’ve got me needing to buy some. I’m thinking whole wheat pumpkin & yogurt muffins (also only moderately sinful)….